Most of us eat fruit everyday, but would you if you saw how creepy fruit can be? Photographer Maciek Jasik reminds us how mystical fruits and vegetables can be with his photo series “The Secret Lives of Fruits and Vegetables”, in which he documents the mysterious relationship humans have had with these foods throughout our history. From Chinese magistrates hanging peach wood branches to ward off evil spirits to Egyptians using pomegranates as a symbol of the after life. We’ve always thought there was something a little bit magic about fruits and vegetables. And with Jasik's mystical, dreamlike photos, you'll never forget it. 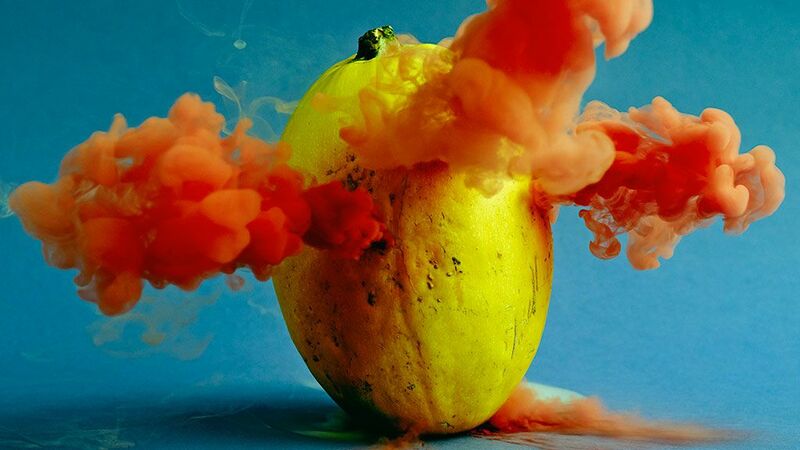 The beautiful photo series shows colored smoke seeping and swirling out of various fruits and vegetables in a fog that's both gorgeous and creepy as hell. Jasik describes his work as "seeking to reach a balance between aesthetic, emotional, subtextual and more mysterious concerns," and it's pretty spot-on with the smoky allure of these photos. You won't want to look away. And even if "Secret Lives" won't make you start believing that butternut squash will prevent bad luck, it will definitely make you feel like there's a hell of a lot more to your vegetables than meets the eye. After all, once you've seen an eggplant bleed purple mist, how can you not?